What Is Insulin? : What Role Does Insulin Play in Diabetics? What Does Insulin Do? And What Is It? What Role Does Insulin Play in the Body? Insulin. We know that our body’s produce it, but that in the case with type 1 or type 2 diabetes, sometimes our bodies decide not to produce enough – or any at all! We know that it is typically given as an injection and we also know that there are some misconceptions associated with insulin – for example, that it causes amputations. So, let’s discuss insulin in greater detail. Doing so will most likely clear up those pesky misconceptions as well! Insulin is a naturally producing hormone in our bodies. It is produced by the pancreas. Its main job is regulating blood glucose levels. Our bodies require glucose for energy. This glucose requires insulin in order to be utilized effectively. Without insulin, the glucose is essentially useless. So, how does this all work? We receive glucose from a couple different sources – carbohydrates from the foods that we eat, and from our lives, which produce glucose. When we take in carbohydrates, our bodies break the carbohydrates down into a simpler sugar – the glucose. It can then be used as energy. But not so fast! We need insulin in order for the glucose to be transported to, say, the muscle where it is needed for movement. When our bodies sense the rise in glucose levels, the beta cells of the pancreas begin to produce insulin. The insulin is released into the bloodstream. To put it simply, the insulin acts as a “key” to “unlock” the cells. Once the cells are “unlocked,” glucose can enter the cells, and can be transported to that muscle that needs energy. What Is Insulin Used For? That is all very well and good, but why are you walking out of your physician’s office with a prescription that reads “Novolog 10 units subcutaneously each night”? If you have type 1 diabetes, you have an autoimmune disease that destroyed your beta cells. This means that, like other autoimmune diseases, your body perceived something in your body as foreign, and attacked itself – and your insulin-producing capability was destroyed. Due to the destruction of beta cells, insulin injections are a requirement in order for survival – without insulin, your body will be unable to process glucose. If you have type 2 diabetes, you may be able to manage your blood glucose levels with diet and exercise. You may require oral or injectable medications. Or, you may be walking out of your physician’s office with that prescription that we talked about. Why? Because sometimes people with type 2 diabetes do not make enough insulin, or their bodies are insulin resistant – and it can get to a point where insulin is required in order to reduce blood glucose levels. Long-acting insulin: This type of insulin works for approximately 24 hours, and begins to work several hours after the injection. It may be used in conjunction with a rapid- or short-acting insulin. Examples include Lantus, Levemir, and Basaglar. 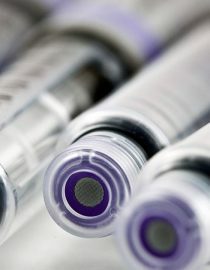 Intermediate–acting insulin: This type of insulin works for approximately 12 to 18 hours, and begins to work about two to four hours after the injection. Due to the fact that it only lasts 12 to 18 hours, it typically requires two injections per day. It is often used in conjunction with a rapid- or short-acting insulin. An example is NPH insulin. Short–acting insulin: This type of insulin works about 30 minutes after the injection, peaks two to three hours after injection, and lasts in the body for three to six hours. Because it works about 30 minutes after the injection, it should be given prior to a meal. Rapid-acting insulin: This type of insulin works about 15 minutes after the injection, peaks about one hour after the injection, and lasts in the body for two to four hours. Because it works about 15 minutes after the injection, it should be given prior to a meal. Examples include Novolog, Humalog, and Apidra. Insulin can be given as injections from a vial, using a syringe, or from a pen, using a pen needle. It can also be administered using an insulin pump. What Are the Main Functions of Insulin? We know that insulin is responsible for glucose metabolism, but did you know that it has other responsibilities as well? In addition, there is glucose in liver cells or the hepatocytes. In the liver, insulin is responsible for the storage of glucose. Insulin also helps to regulate fatty acids of the liver. Next page: can you take insulin orally? And the three most common misconceptions of insulin. Can I Take Insulin Orally? However, there may be a future for oral insulin. Tregopil has already had positive clinical data in 2016 in a Phase I study in the United States, and will also be studied in type 2 diabetes participants. Inhaled Insulin, What Is It? If you’re prescribed insulin but a bit leery, you could try inhaled insulin. In June 2014, the FDA approved Afrezza, which is an inhaler with pre-measured, rapid-acting insulin, so it is used before meals. At this time, there is only a rapid-acting insulin that is in the inhaled form – so if you have type 1 diabetes, you would still require an injection for a basal insulin (long-acting or intermediate-acting). There are some contraindications to inhaled insulin – it should never be used as a treatment during diabetic ketoacidosis (DKA), and if you have COPD or asthma, it is probably not the insulin for you. Now that we’ve discussed what insulin is, let’s talk about what diabetes isn’t. I have heard a lot of different falsehoods about insulin in my diabetes education practice and there are a few I’d like to clear up. Insulin is not a sign of failure. Diabetes is a progressive disease, and this is the perfect time to remind my patients of this. The second misconception I often hear is that insulin causes amputations. If anything, insulin prevents amputations, but I can understand where my patients are coming from. Often what is happening in patients who are requiring amputations is that their blood glucose levels are not under adequate control. When this happens, a sore or ulcer is not healing and ultimately, an amputation is required. Another possibility is that these patients have waited too long to start insulin because they did not understand the importance of starting insulin when their blood glucose levels were running dangerously high. And third, insulin injection hurts! Another falsehood. I have educated patients as young as two years old, and as old as 90, to give insulin injections. There have been several people who state that the injections hurt – but the vast majority – even the two-year-old, find that the needles and syringes available to us now do not hurt. And if it does, it is probably an issue with your insulin injection technique, meaning it is time to get back in touch with your diabetes educator for a refresher! Insulin… you may not love it, but you may need it to survive. Knowing what it is and why you need it is half the battle.